I love this Town; as a lawyer, I understand complex issues; I have experience on several boards and know the difference between governance and operations. A peaceful place to live with other respectful and diverse people, who help each other and prosper, with careful attention to our natural resources including Georgian Bay and Little Lake Park. A place with good governance from Council along with good management by diligent Town staff. (a) Encourage the creation of new jobs by supporting the EDCNS, by keeping taxes as realistically low as possible, by encouraging youth to engage in community volunteering to build up their skills for future job opportunities. (b) Promote peaceful and law abiding neighbourhoods by closely monitoring law enforcement by the Ontario Provincial Police and the by-law enforcement department with respect to cannabis use and possession and the illegal trafficking of drugs, among other things. (c) I will attend all Council meetings, prepared by having read all the materials. As a lawyer, I am trained to ask questions in order to discover the truth. (a) I have been serving the public for almost 20 years including as a Crown prosecutor for 16 years, on several boards, volunteering and as defence counsel. I have been a lawyer for almost 20 years. (b) I am highly educated but practical and have knowledge of a variety of subjects including: science, law, research, governance, dispute resolution, negotiation and small business finance. (c) I have worked in 5 provinces and have travelled extensively in Canada. But Midland and the Georgian Bay area has always been my favourite place since childhood. I worked here at the Motorola plant making car radios on the assembly line in the early 1970’s; prosecuted in Barrie and Midland in the early 2000’s; and finally bought a house here in 2014. 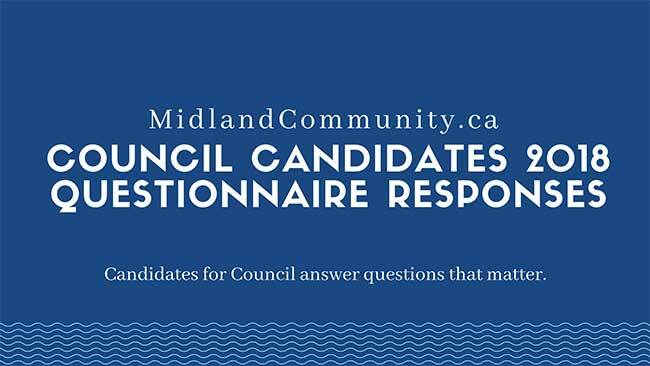 Be the first to comment on "2018 Council Candidate Questionnaire Response – Roberta Bald"